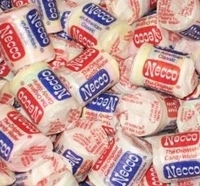 Necco candy wafers in mini rolls. Each mini roll comes in the original flavors: orange, lemon, clove, chocolate, cinnamon, licorice, Lime and wintergreen. Each bag has 20 mini rolls of candy wafers.